Today was overcast and, eventually, rainy, ruling out the beach. 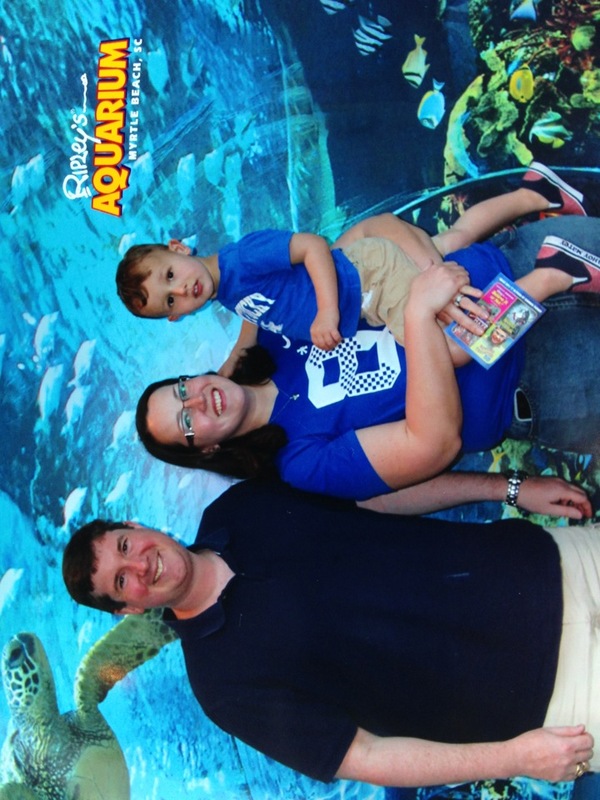 Not wanting to sit inside and stare at each other all day, we headed to the aquarium. And saw fish. A lot of fish. We even visited a few dinosaurs. 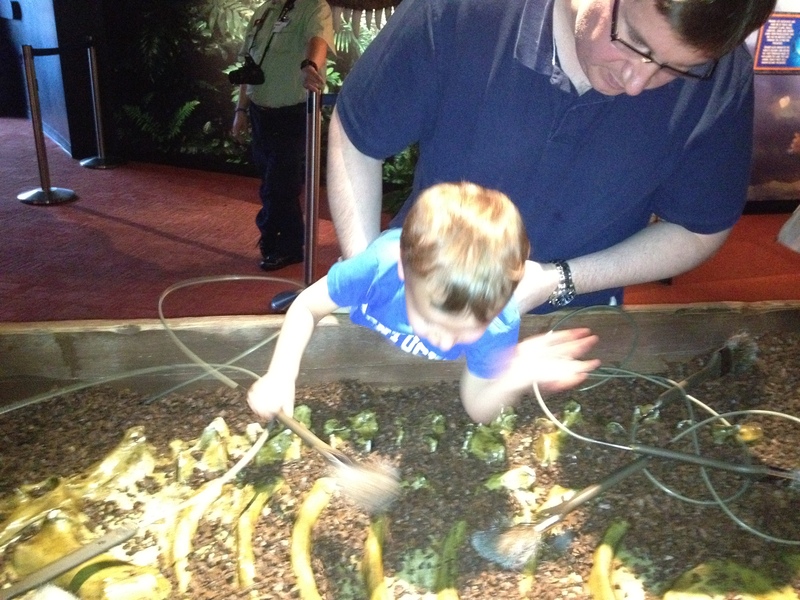 Once he was finished being terrified of the t-rex who roared in his face, Robbie managed to give him a high five. He dug through some ancient artifacts, too. And then, after an hour, we were done. 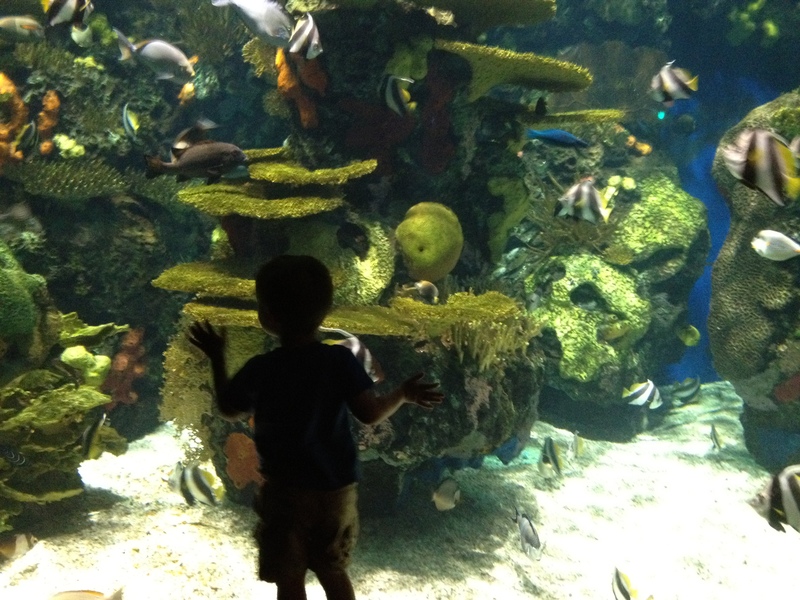 Robbie had run around the aquarium seven times. He had stolen the same ray gun from the front of the gift shop fifteen times. 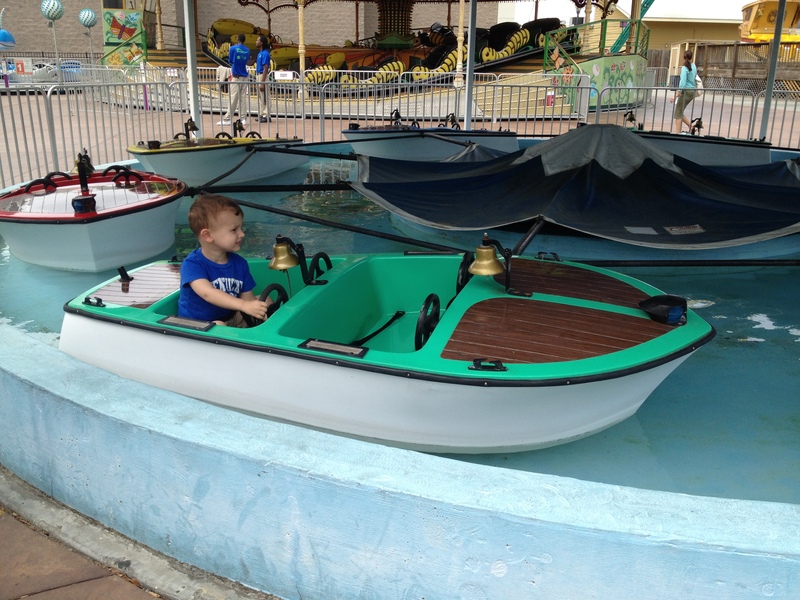 So, to keep ourselves from teaching Robbie to swim with the sharks, we headed out to the boardwalk. 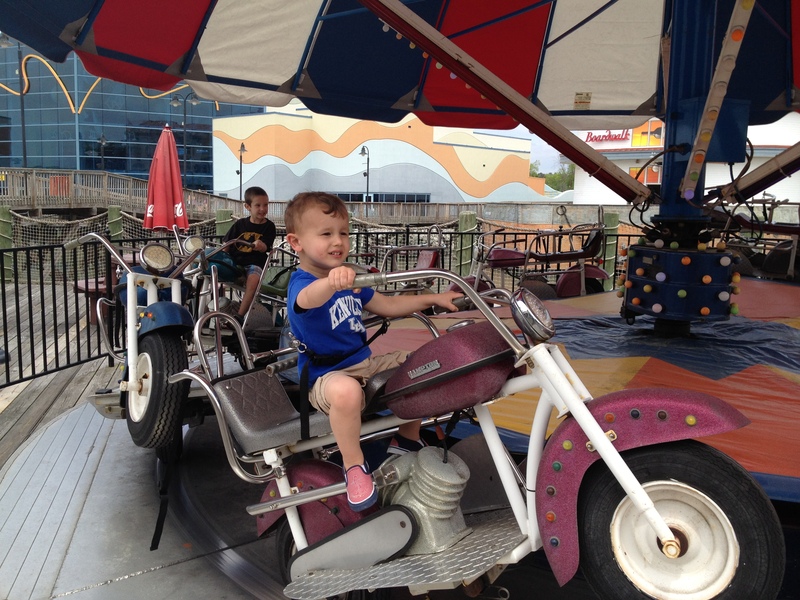 There were some old school rides, and Robbie got to take a spin on the carousel. 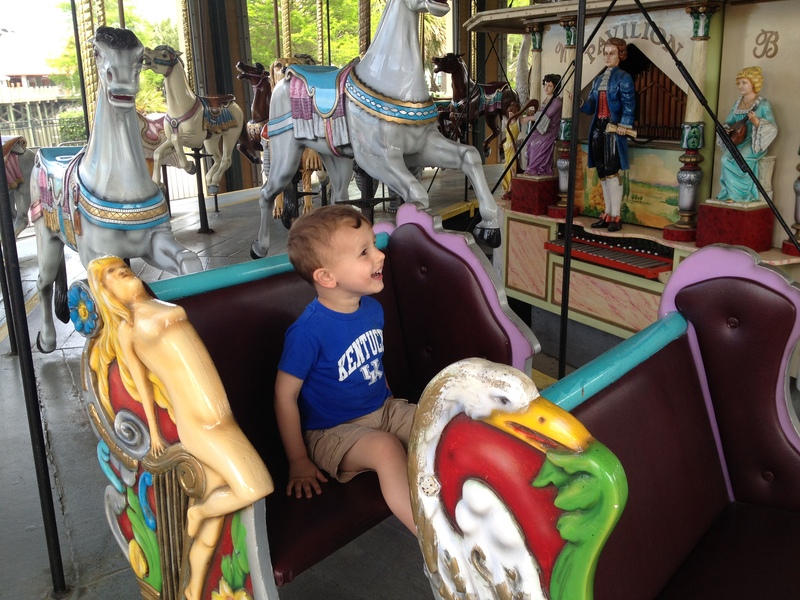 Unfortunately, he wouldn’t ride any of the animals. And a few other rides. Robbie knew he was headed for an adventure. 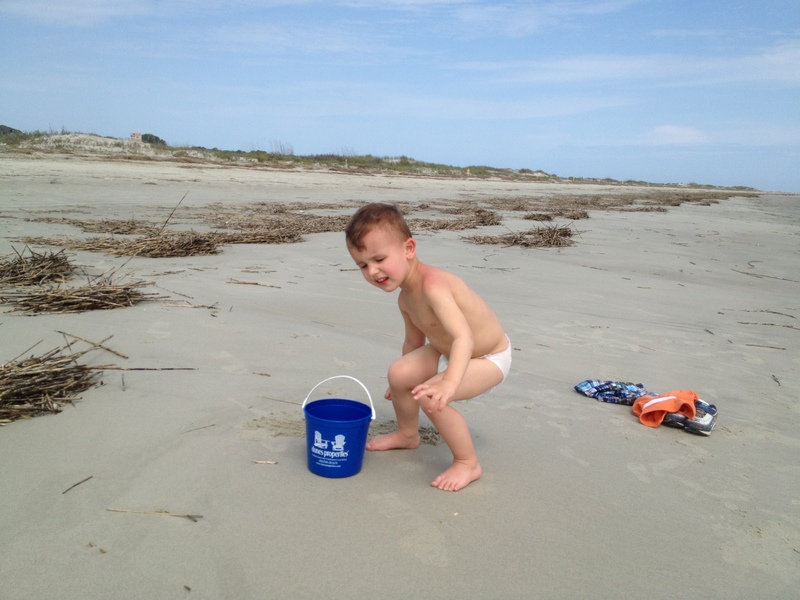 Bless his heart, he told us he was ready for it every thirty minutes on the ride to the beach. You know, just in case we had forgotten. 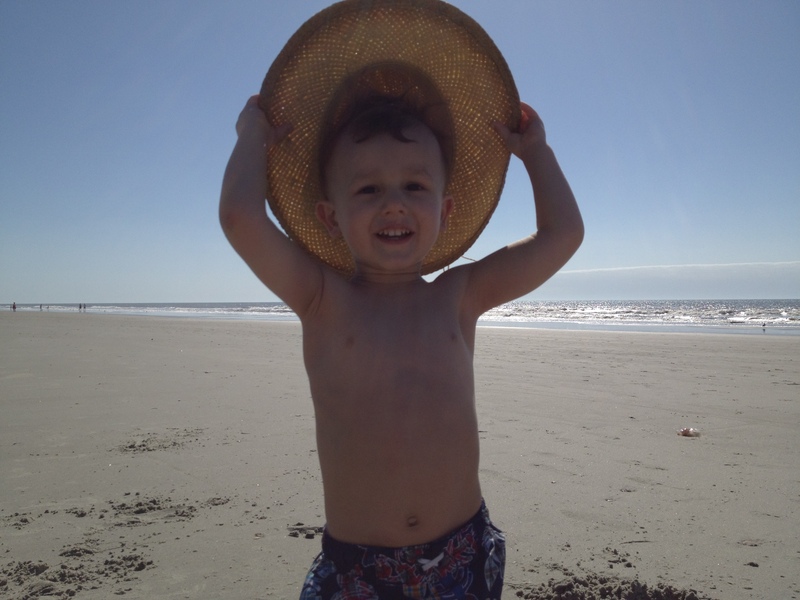 And our first morning in Myrtle Beach, he was in our room bright and early, ready to go to the beach. We’ve actually had to convince him the past two mornings that 7:00 is a little too early to put your bathing suit on. 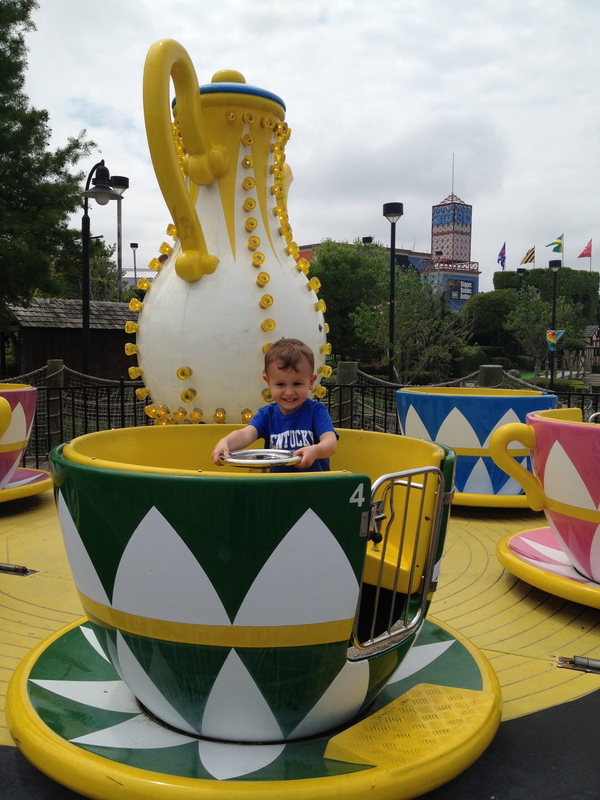 He has had a blast the past two days. 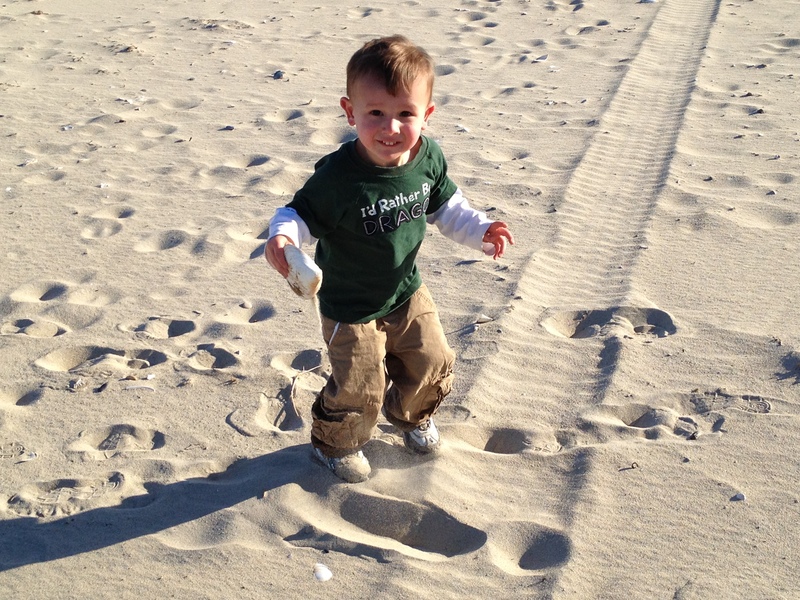 There’s been a lot of playing in the sand. A little frolicking in the waves – they tickle your feet when they come in. 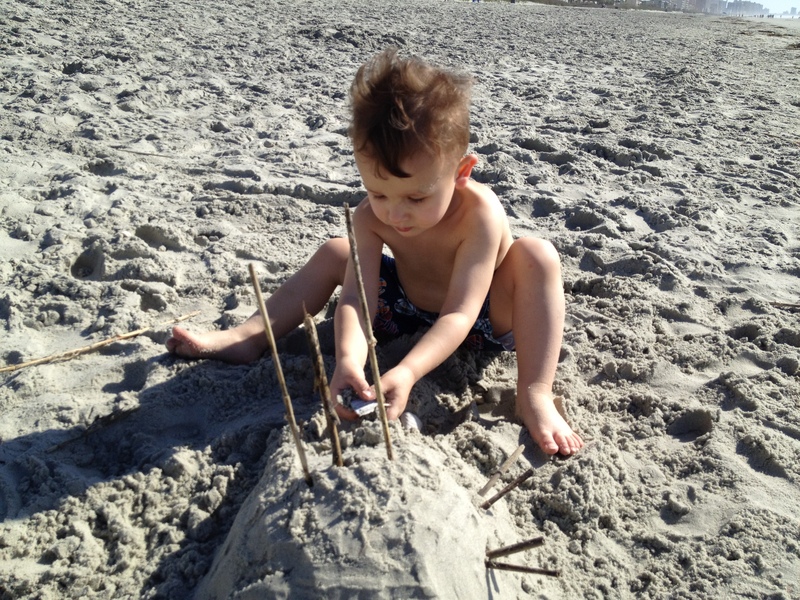 But, after a few wipeouts, he stuck to building pirate ships. 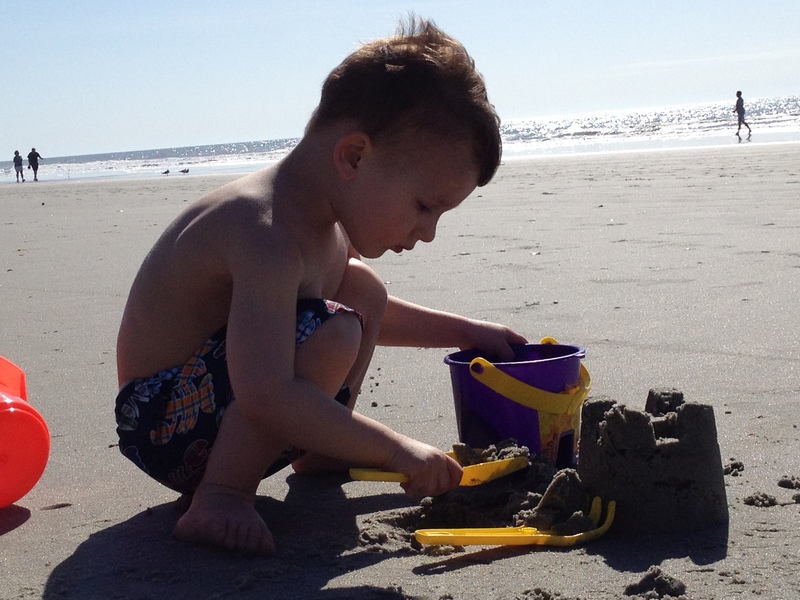 And filling his lucky bucket with sand. 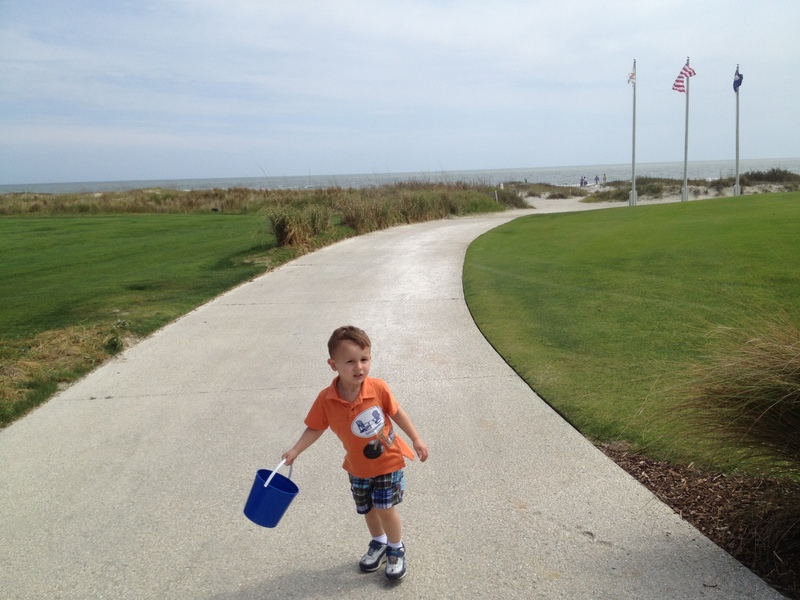 Incidentally, I have no idea how this became his lucky bucket. It hasn’t brought him any gold and it’s also his only bucket. But, hey, what ever works. Who am I to judge? I can’t wait to see what tomorrow holds; I’m sure it will be another fabulous ‘venture. Justin: I don’t know. Let’s check my calendar. (Pulls out phone). OK. Looks like I’m in Saratoga until Saturday night. 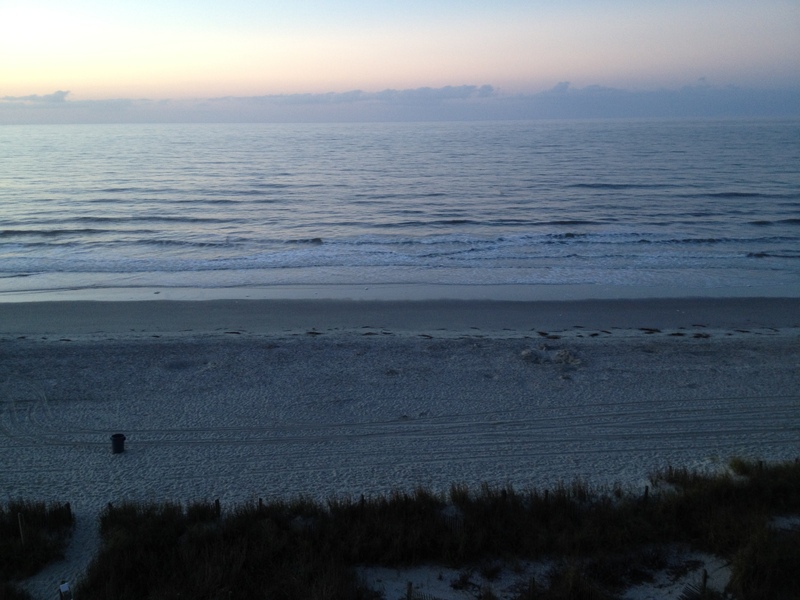 Then I’ll be in Myrtle Beach for four days at the end of the week. (Puts phone away). Me: (Baffled by his nonchalance). OK. So, you’re going to the beach while I’m at home? Alone? With the child? And off from work? Me: Listen, I know you’re going for work, but I’m just going to throw this out there. 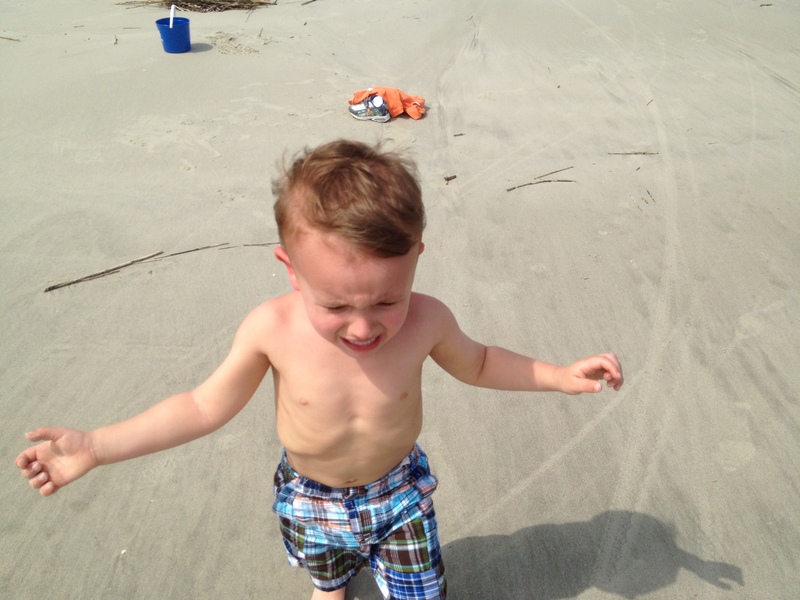 If you are at the beach, in a beachfront hotel, for four days while I am home with YOUR child and not at work, I am not going to be nice to you. At all. So, I think we probably need to reconfigure how this is going to work out. And that, ladies and gentlemen, is how I finagled a beach vacation during spring break. Of course, it helped that there just happened to be a ridiculously low-priced oceanfront condo available. Definitely worth the 15-hour drive. Especially when this is what we woke up to the next morning. 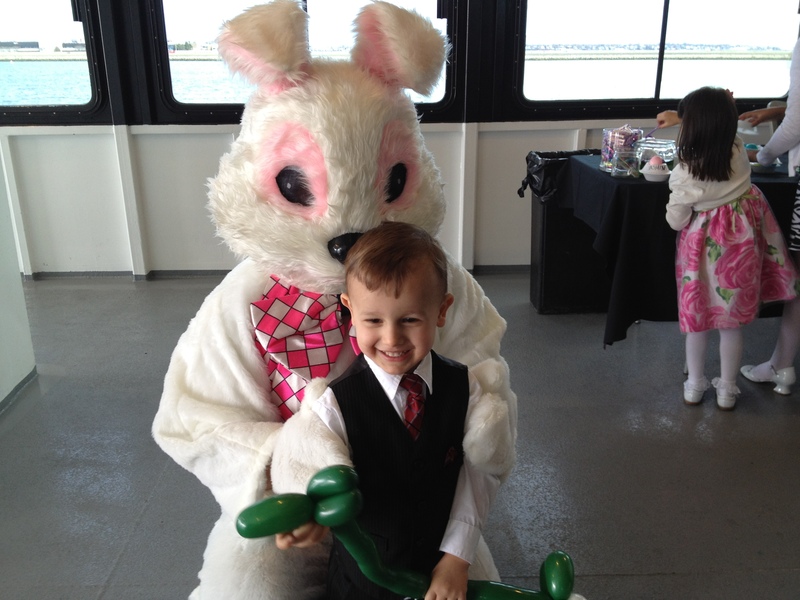 Two years ago, we took Robbie on the Odyssey Easter brunch cruise around Boston Harbor for his first Easter. 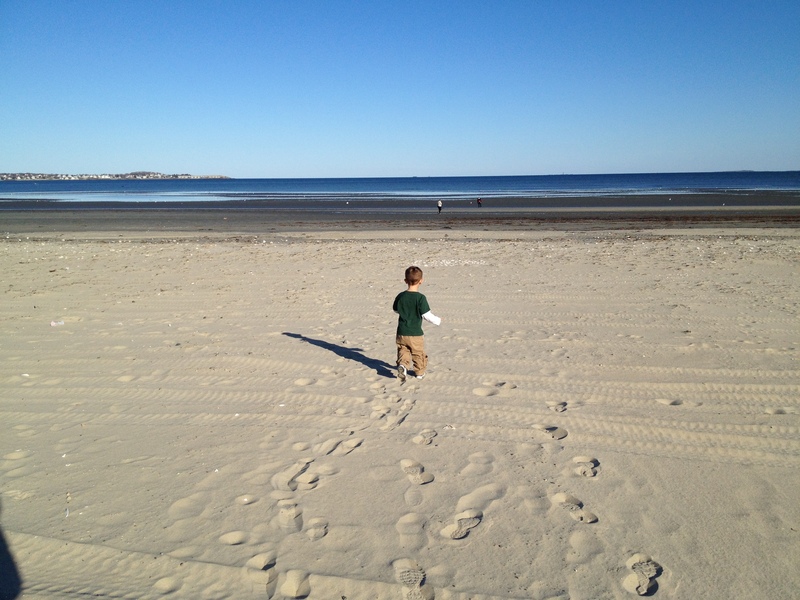 We had done it twice before; once the year we were planning to move to Boston and again when I was pregnant with Robbie. 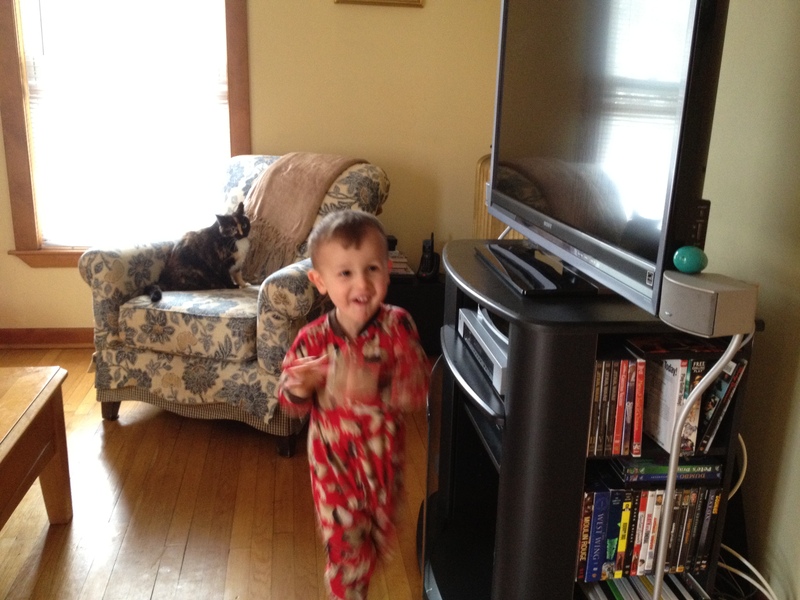 The picture from Robbie’s first Easter remains one of my favorites. 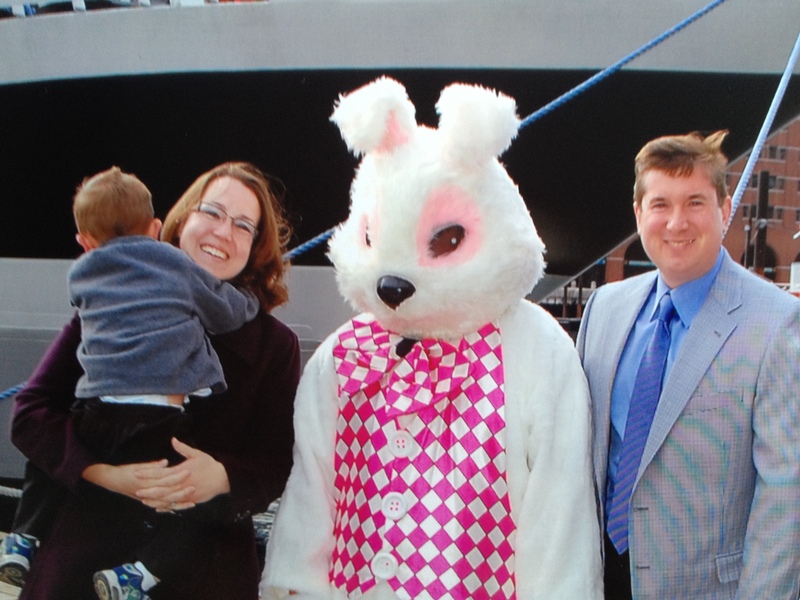 We are in front of the boat with the Easter bunny. Justin is, of course, standing uncomfortably close to the rabbit – he may actually have his arm around him; Robbie and I are on the other side, about a foot away from the beast. Robbie has said, more than once, “Daddy. Easter bunny. Good friends.” when looking at the picture. I was hoping for nothing less for this year’s family Easter picture. And I was rewarded. What you may not be able to tell from the picture is that young Robert has a death grip on my neck and his knees are pinned to my sides in case I manage to untangle myself from his grasp. He refused to even look in the direction of the Easter bunny, turning his head away any time I tried to get him to say hello. You’ll also notice that Justin continues to stand awkwardly close to the Easter bunny. Fear not. We did get a good picture with the bunny. My child may be many things, but a fool he is not. The Easter bunny came to our table once we set sail. With candy. After that, Robbie was happy to stand with the pink-eyed rendition of the Easter bunny to have his picture taken. Being the excellent and organized mother that I am, I figured it would be best to let Robbie decorate his first Easter egg on a boat in the middle of Boston Harbor. Actually, I had totally forgotten about dying eggs until I saw the table at brunch, but telling the truth about that would just make me sound like a terrible mother. 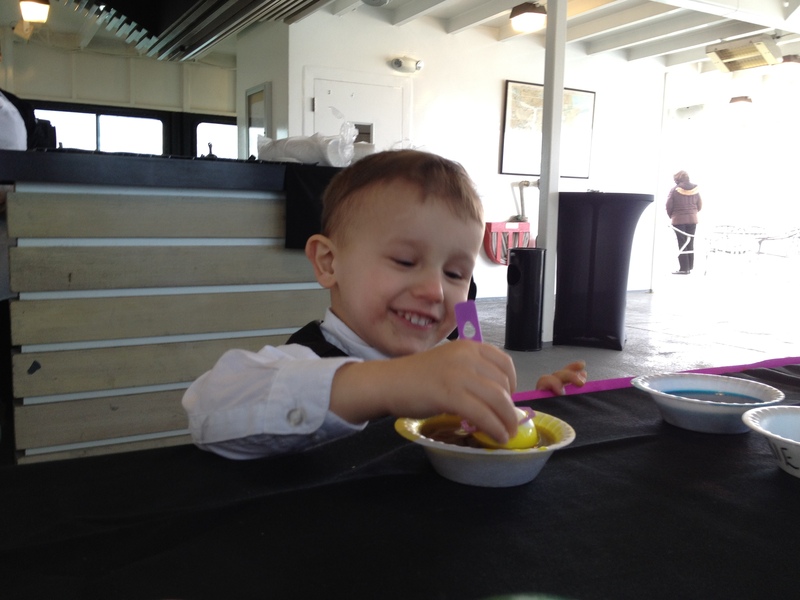 Given that the boat was virtually empty, Robbie got to dye two eggs and later learned the intricacies of eating a hard boiled egg (which he hated). We did manage to have a little bit of an Easter egg hunt later in the afternoon (yes, afternoon; I am fully aware that my child is in his pajamas). It was thrown together last-minute after I got home from church, but Robbie’s young enough that he doesn’t know that. In fact, he still thinks it’s pretty incredible that he got an Easter basket at all. I’ll enjoy that freedom while I can… I’m sure it’s not going to last much longer. 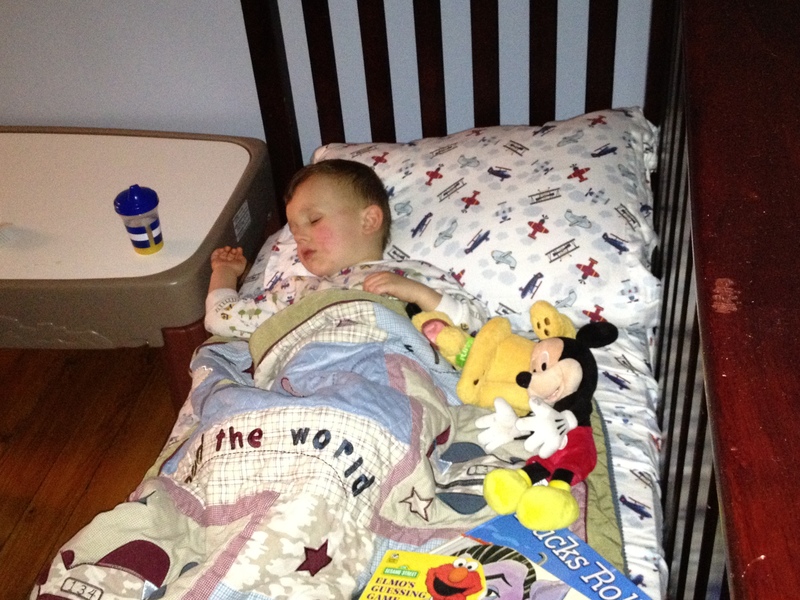 I shared my bedtime woes with a good friend of mine, and she imparted some get-your-kid-to-go-to-sleep wisdom. And, no, it doesn’t involve any direct form of torture or physically attaching your child to the bed. Incidentally, I’d been spending my free time trying to concoct some sort of invention to do just that, especially since Robbie is no longer in a crib and can roam freely. Once Jill shared this wisdom with me, it made so much sense. It seemed so simple. This was, obviously, why it had not occurred to me. Bedtime became an emotional struggle; the time of day I dreaded the most. Although now I still face it with some trepidation, it has improved. Jill said she went through her whole bedtime routine and tucked her son in, explaining that it was time to go to sleep and she would see him in the morning. She then positioned herself outside his door, waiting for the eminent escape. The first time he made a break for it, she went through the whole tucking in routine again. Any time after that, she simply picked him up and put him in bed without saying a word. I didn’t buy it at first. After all, I would be up all night returning Robbie to bed with this method. But, seeing as how the child put a dent in my newly painted walls throwing books out of his room when I had a baby gate in the door, I figured it was worth a try. The first night, it took 45 minutes. The second night, 30. And the third night, it just took one tuck in. Don’t get me wrong, we’ve had relapses. And don’t even get me started on the night Justin deviated from the schedule to watch the high school seniors announce their college selections and let Robbie watch it with him (Justin is typically not allowed to make an appearance at bedtime because he is too fun and the child uses him to get his way). Most recently, I used the technique at nap time. We haven’t had a good nap at our house in weeks. Months, even. And. It. Worked. The kid was asleep within minutes. Of course, this may be because he’d been out running on the beach like a fool for three hours, but it may also be my impressive parenting skills. I’m going to go with the latter. And so, as I close, it is almost time for another bedtime. I’m not sure I have enough energy to face it, but I know the fall out will be greater if we deviate. I think I can; I think I can; I think I can. Just ’cause that’s what Rob wanted to do. 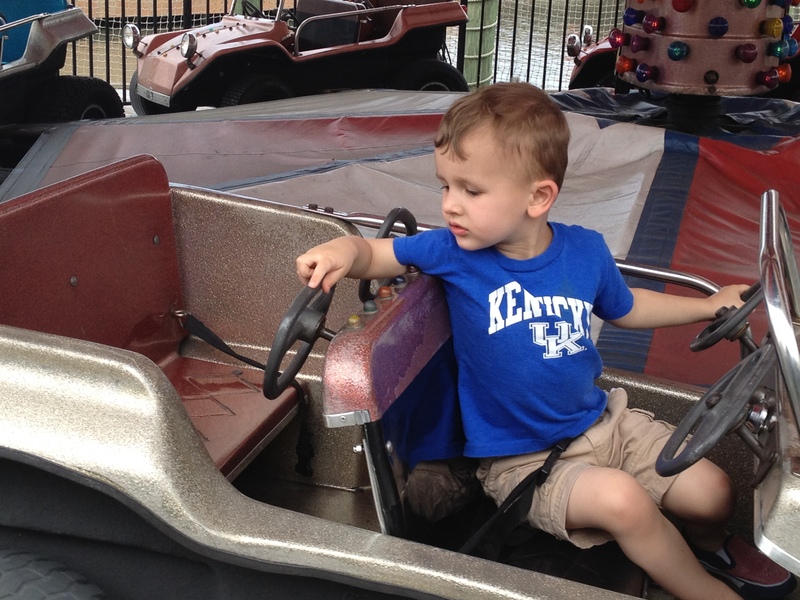 I was off for Good Friday, so Justin and I went to pick Robbie up at daycare together. 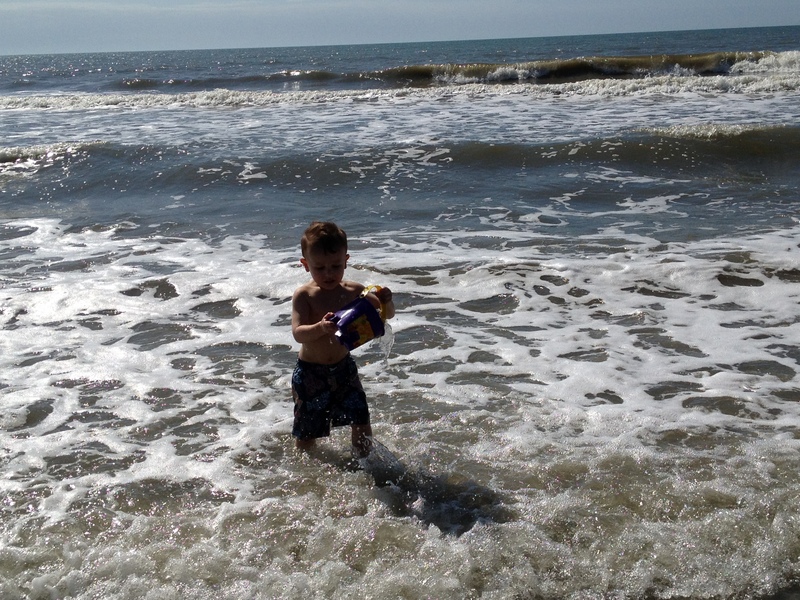 We were halfway home when, from the backseat, we heard a little voice say, “Wanna go beach, Mom. Eat dinner.” Justin and I looked at each other, shrugged, and turned the car around. 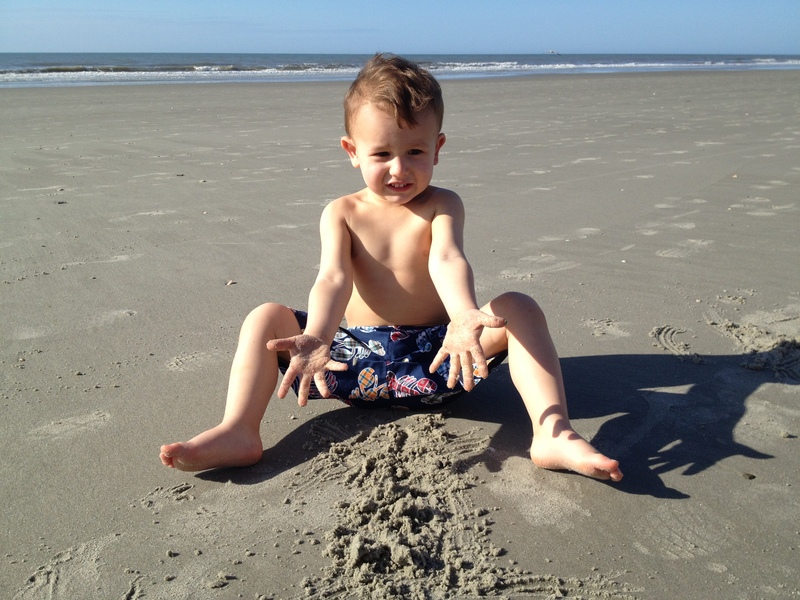 We didn’t spend a lot of time at the beach; just enough for Robbie to run around, get a little wet, dig in the sand, and generally make us happy. We grabbed some Kelly’s (just one more thing to miss when we leave) and ate by the beach. And then we went home. It probably took us more time to get to the beach than we actually spent there. It was most definitely a silly thing to do. But sometimes it’s fun to be the grown-up and get to make those decisions. It’s even better when you have a two-year-old to remind you that it’s OK to do things spur of the moment and that, more often than not, life is better that way. This time last year, I ran my first ever 10K at the Cohasset Road Race by the Sea with a good friend of mine. We plowed through it and finished in 1:22:45. Anna and I managed to run the first four miles without stopping. We may have walked .25 miles of the 6.25. This year, although I am still waiting on the official time, I finished in 1:06:57. Almost 16 minutes better than last year. I’m not sure when it happened. Probably when I started running with friends who are much faster than me, who talk while we run which makes it feel much less like a grueling workout. And today I found myself facing a new challenge. Justin registered me for my first marathon. Memorial Day in Burlington, Vermont. I started training partway through the program – an eight-mile run tonight. It was pretty terrible for the first mile, my body still angry with me for the race on Sunday and medication I’ve had to take for my jaw this week. And then, you know what happened? It wasn’t so bad. I took my time and did the whole thing. Yes, I walked. It took me a little over an hour and a half. I’m not sure how I’ll be feeling on Saturday after a 16-mile run. But it is time all on my own without anyone to watch, clean up, or run after. Yesterday, when I read Justin’s Facebook status about the Final Four, I had a few questions. It went a little something like this: “My Final Four in 1998 – hiding bourbon from RAs. My Final Four in 2012 – hiding candy from my two year old.” I didn’t fully understand it until this morning, when I asked Justin why Robbie’s bathroom stool was on top of the refrigerator. He had me get it down and ask Robbie to get candy. Robbie said, “Sure, Mom! Get candy!” He carried the stool to the kitchen sink and climbed up. He was dismayed to find (please don’t judge) dishes in the sink and refused to go any further. I didn’t understand this but moved the four cups (see, it wasn’t that bad!) to the counter.